In order to prep for Edge of Darkness, I’m going to give this Mel Gibson treat a try. Against long odds, a young boy (Nick Stahl) works hard to pass the entrance exam that will allow him to enter his late father’s alma mater. The handicap is that he’s ignored by his mother and sisters. So, he asks Justin Mcleod (Mel Gibson), an ex-teacher who’s horribly disfigured, to tutor him. As they work hard together to prepare for the examination, the man and boy forge a friendship that could heal the wounds of both their pasts. This is Mel Gibson’s second attempt to show that hey he can act and have a lot of heart, rather than just being the action hunk like in all those Lethal Weapon films. The film I will give it one thing does have a lot of heart. It creates this relationship, that at times is questionable, between an older man who has had this accident and a young confused kid. I felt like this movie does bring out some heart-felt scenes between the two and I felt like the scenes of Gibson teaching were some of the best in the film. However, this film does get a little bit too much for a long time. The teenage angst that Stahl faces comes off and on about 100 times in this film and one incident after another, I just got annoyed of his moods changing every time. Even worse was his family who is probably one of the worst I’ve seen cause they do nothing but tease this kid, and then they wonder why he is always acting up. There is also no freshness to this story. It is probably the same story you have seen all the time with the man having problems with his life, and the boy with his, I just didn’t sense any originality. There were no suprises when it came to the story and the way it was handled because, though i thought some speeches were good, almost all of the scenes ended the way I thought were going to. Gibson does a very good job as both director and lead actor. He handles this movie with little inspiration, but also gives a very heart-felt and believable performance. But the best is Stahl who later on would get bigger roles, but shows that at an early age he should be getting even bigger roles because he does shine here as the kid. 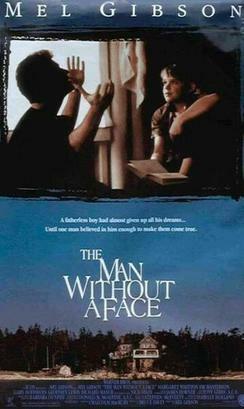 Consensus: The Man Without a Face has inspired direction and acting from Gibson with some heart-felt scenes, but isn’t very original and comes off as way too predictable at points.